Michael Griffith graduated from London Veterinary School in 1993. He spent 2 years in mixed practice in England before joining Jubilee Veterinary Centre in 1995 and has been a director for over 10 years. 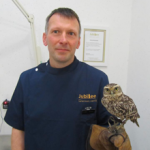 He is involved in all aspects of the practice especially exotic animals including private birds and reptiles. Michael is the main vet for Belfast zoo.